Kathleen Wynne's main challengers spent a good part of Saturday criticizing the Ontario Liberals over the province's gas-plant uproar, hoping to capitalize in the last week of the provincial election campaign. At a campaign event in east Toronto, NDP Leader Andrea Horwath said Ontarians don't "want to have to hold their nose with the stink of corruption that continues to flow from Queen's Park" and "are clear that they want change." "This election itself is a referendum on corruption," she said. "I think anybody who is not prepared to understand that that's why we're in this campaign in the first place,... they're not paying attention to what Ontarians are saying." Horwath also sent an open letter to Liberal Leader Wynne and Progressive Conservative Leader Tim Hudak on Saturday imploring them to ask the Speaker of the Legislative Assembly to turn over documents demanded by police investigating the gas-plant scandal as soon as possible. The letter says Ontarians "deserve the facts" about the issue before they go to the polls on Thursday. The gas plants have made waves since the governing Liberals tore up contracts to build two gas-fired electricity generating stations in Oakville and Mississauga in 2010 and 2011, respectively. The government initially said the cost of cancelling the power plants would be $230 million, but the province's auditor general later pegged the number closer to $1 billion. Hudak campaigned Saturday morning at the empty site in Mississauga where one of the plants would have been built. Standing in front of six chest-high pallets made to look like they were filled with $100 bills, the PC leader said "this is what a billion dollars looks like." The money could have gone toward a new hospital planned for the area, or a variety of other causes, he said. "This billion dollars could have built the Peel Memorial Hospital in Brampton twice. Instead of saving two Liberal MPPs' seats, they robbed us of thousands of nurses, personal support workers, special needs teachers." Hudak himself actually supported scrapping both power plants, but he said he never would have chosen the Mississauga location in the first place. The decision to cancel the plants was made under Wynne's predecessor as premier, Dalton McGuinty, and she took no part in it. But her opponents have harped on her for signing a cabinet authorization at the time for the government to negotiate a settlement with one of the companies that had a contract to build the plants. 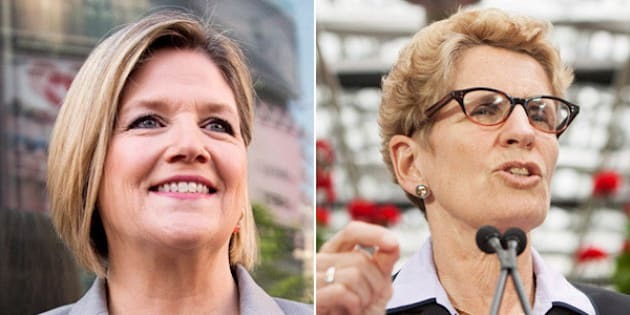 The issue bubbled up in the election campaign this week when Horwath and Hudak hammered Wynne about it from the get-go of Tuesday's leaders' debate. It made headlines again on Thursday, as the Ontario Provincial Police confirmed they've obtained a court order to force the handover of relevant documents from the Ontario legislature. The order requires the files be turned over within 10 days, but the NDP's Horwath is asking her counterparts to press for the release of the files as soon as possible so voters can take stock of them before the election. Police also confirmed that they interviewed McGuinty back in April about computer files in the premier's office that were allegedly deleted as he was stepping down. McGuinty is not under investigation.